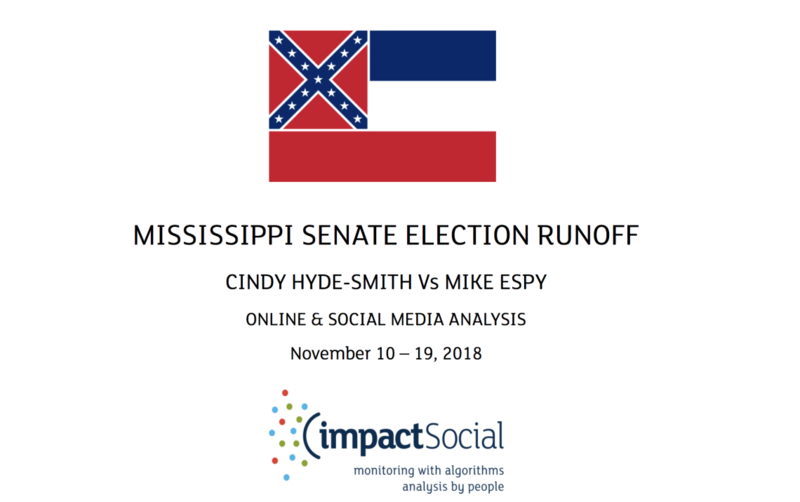 Our insight (full report here) shows Mike Espy connecting extremely well with voters. In addition they have been handed two lifelines due to Cindy Hyde-Smith’s comments on public hanging and voter suppression which have been seized upon and skilfully exploited by team Espy. This has resulted in many - including Republicans - to conclude that Hyde-Smith is not fit to represent Mississippi. In addition, Espy has done well to drive attention towards his policy ambitions, particularly education and healthcare. With eight days left until polling day Espy is in a good position. His rival candidate is reeling from attacks of racism and incompetence, while he stands tall. He should feel confident that his campaign is going as well as might have been expected at this stage of the campaign. The antithesis is Hyde-Smith. Thousands of in-state conversations suggest that she is a poor candidate who lacks empathy with the public. Very few people have anything positive to say about her personally – though some suggest that her comments on hanging were due to naivety rather than anything more sinister. Regardless, this analysis clearly shows that momentum is moving toward her opponent. Ordinarily this would point to a surprise victory for the Democrats. However to enable the full picture to be appreciated it is essential to take into account the in-state sentiment towards President Trump. In conclusion, in each of the states covered, the Democrats destroyed their opponents, but lost out to Trump. This analysis shows a similar pattern is emerging in Mississippi. This election will therefore be determined by two main factors: Democrat turnout for Espy Vs Republican turnout for Trump.